Sister Helen Cole has been working in Camden since 1991. Several years after arriving in North Camden in 1991 to teach second grade, Sister Helen Cole found a new calling: counseling families devastated by violence. She became a licensed clinical social worker and embraced her new role in a city then dubbed the most dangerous in America because of its violent crime rate. She comforted parents whose children were lost to the streets, holding their hands in court hearings for their accused killers. "It was just a terrible time for Camden," Sister Helen recalled last week. "People were just fearless." Nearly three decades later, Sister Helen remains a beloved fixture in the city where she has become known as the "Mother Teresa of Camden." These days, the Roman Catholic nun's mission has come full circle: working with the living — the city's young people — to stop the cycle of violence and inspire a new generation. "She has a deep passion for the people of Camden and their need for healing and hope," said longtime friend Msgr. Michael T. Mannion of Mary Queen of All Saints Parish in Pennsauken. Her pride and joy is a youth group known as CASA — Camden Adolescents Striving for Achievement — started in 2012 with just 10 high school students that has grown to more than 100 members who meet five days a week in a converted rowhouse, where students get tutoring, leadership training, college prep and career options, and a place to hang out with friends and avoid Camden's gritty streets. "It gives us a safe place where we can be ourselves," said Isa Ias, 18, a senior at LEAP Academy in Camden. "They made me focused on school, way better than what I was." Teens participate in an activity during the CASA after-school program at Guadalupe Family Services. Sister Helen has shifted her efforts largely due to a decline in violence in Camden. In 2017, the city had 22 murders, the lowest number since 1987. Many attribute the turnaround to a new approach by the Camden County Police Department, which succeeded the city police force in 2013. 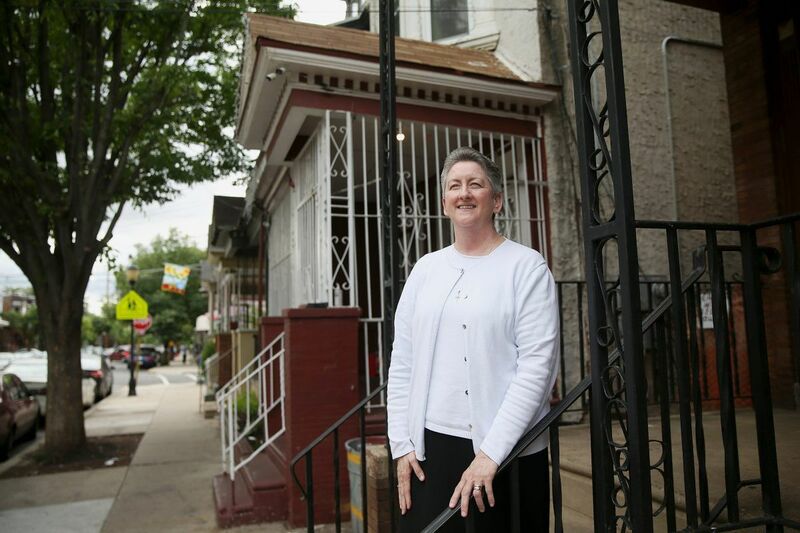 From her second-floor office at Guadalupe Family Services on State Street in North Camden, Sister Helen looks out the window and sees hopeful changes in the neighborhood. She sees progress in the white plastic furniture on a neighbor's porch, which would have been snatched in the old days and sold for drugs. Gone, too, are the days where gunshots once rung out daily, drug dealers boldly ran open-air markets on street corners, addicts passed out on her office steps, and a sister at her since-closed convent a few doors down the street was robbed at gunpoint. "There's so much good that's happened that it doesn't have that same feeling of being destitute and rundown," she said. "I think there's so much hope for Camden." A native of Roxborough, Sister Helen, 60, joined the Sisters of St. Joseph after graduating from Chestnut Hill College. In 1991, she was sent to Camden to teach at Holy Name School while earning a master's in social work at Rutgers-Camden. That year on Mischief Night, Camden went up in flames with hundreds of fires set in the nine-square-mile city. Sister Helen was trapped in the city and her father, a Philadelphia police officer, called, telling her, "We're coming to get you." "They were burning the city down," she said. "It was a dark day." Little did she know there would be more dark days years later as the death toll mounted in Camden. She opened Guadalupe in July 1995 along with a doctor and Jesuit priest, as a ministry of Holy Name, offering medical, legal, and social services. She planned to work with children with behavior problems, but that changed when Lourdes Vasquez walked in a month later seeking help finding her daughter, Shaline Sequinot, who had vanished. Sequinot, 13, had been sexually assaulted and fatally stabbed. She was the 27th of 58 murder victims in the city in 1995. The slaying went unsolved for five years and Sister Helen became one of Vasquez's strongest advocates in bringing the girl's killer to justice. She organized vigils, handed out yellow ribbons, and counseled the family. Soon, other victims' families began seeking her out for counseling, too. Camden County Police Chief Scott Thomson said Sister Helen and her team have helped police efforts by offering help and healing to traumatized residents. Since 1995, she has held a vigil at the end of every year to honor the city's homicide victims, lighting one candle each hour for each person. In April, the FBI in Philadelphia presented her with its Director's Community Leadership Award. Sister Helen Cole (fourth from right) and members of Guadalupe Family Services received the FBI Director’s Community Leadership Award from FBI Philadelphia Special Agent in Charge Michael Harpster. "Her efforts know no bounds and she regularly goes above and beyond for families in need with an unmatched grace and respect for victims," the chief said. She remains as passionate as she was in the '90s when she led a protest at police headquarters demanding an end to the violence, said Assistant Police Chief Joe Wysocki. "She's an amazing lady." Guadalupe, which has three social workers and two staff members, also participates in a police gang intervention program, Project Guardian, that uses community leaders like Sister Helen to combat violent crime among young people between the ages of 12 and 18. The program seeks to help at-risk youngsters — truants and lookouts for drug dealers — before they get into bigger trouble. "We can't save everybody, but we sure try," said Sister Helen. "They get lost in the street." On a recent afternoon, the mood was upbeat in the Guadalupe headquarters, where about two dozen teens met for about two hours. They listened intently to a presentation by two state police officers, peppering them with questions. In another room, a student studied at a computer for a lifeguard exam. In the front office, mothers picked up free diapers. Bilaal Gilliard, 23, a Rowan University senior biology major, who was in the first CASA class, stopped by to check out the renovated space. Guadalupe created the "Next Step" program for college students like Gilliard to stay connected. Sister Helen Cole talks with Bilaal Gilliard, a senior at Rowan University from Camden. "Sister Helen is an angel. You can tell she cares about us," said Gilliard, an aspiring neurosurgeon. Avlette Leyba, 23, hopes to become the first graduate of the program to become a lawyer. She plans to enroll in Rutgers-Camden Law School in the fall. "I wouldn't be where I am without this program," she said. Sister Helen said their success stories give her hope and keep her committed to working in Camden. Her agency still provides counseling and services to the needy. A summer camp for youngsters and "Adventure Week" for older students are planned this summer. "I'll never stop praying for peace and advocating for peace," she said. "The day I give up hope for Camden is the day I need to leave."